Moody distant screams slowly gain momentum overpowering you with a certain kind of tingly uneasiness, almost as if a ghost just past over you. As the screams get louder they are blasted off the face of this Earth with some thunderous drumming which is intent on going straight through your forehead no questions asked with two wailing guitars under it’s arms. That my dear readers is merely the first 47 seconds of Powertrip’s opening track ‘Crop Circle’ which only proceeds to get better. 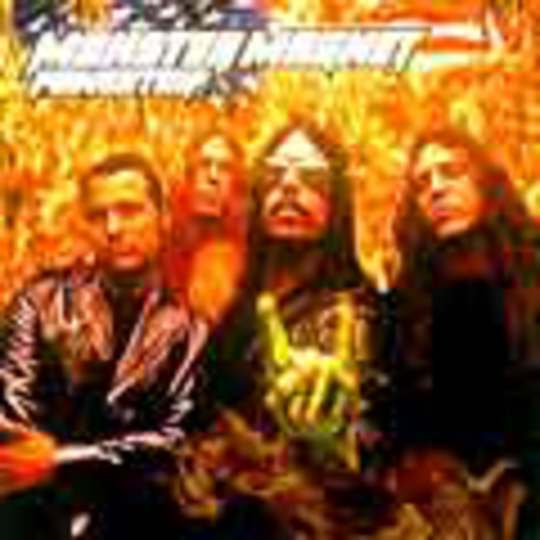 Some bands may do concept albums, but to Monster Magnet every track is a different concept, from the calming acoustic intro on ’Space Lord’ to the return of the haunting screams and swirling sounds that seem to surround you on ’Goliath and the Vampires’, they make every track come alive and as such manage to keep your attention with the varying styles. While it’s a departure from the more psychedelic desert style rock of old (later captured again in places on ‘God Says No’), Monster Magnet show to all the doubters that they are not a one trick pony and produce some of the best rock and roll tunes of 1998. Like all other MM albums, this one has it’s own distinct sound setting it apart from the others, much like Radiohead, this band continue to innovate and re-invent their sound every album. Powertrip is by far the most accessible ‘Magnet album to date and is probably the one new listeners will warm to the most on first listen. This is an hour and a half of pure music, all killer no filler! (Now if only Sum 41 could say that without being ashamed). A worthy entry for your CD collection.